Tetley tea is a tea company with a history spanning over 175 years. Tetley tea is most known for its teabags, which include the popular drawstring teabag, first unveiled in 1997. Originally British, Tetley is currently owned by Tata Tea Limited. In 1822, brothers Joseph and Edward Tetley began their business by peddling salt from the back of a pack horse in Yorkshire. Later they added tea to their supplies. 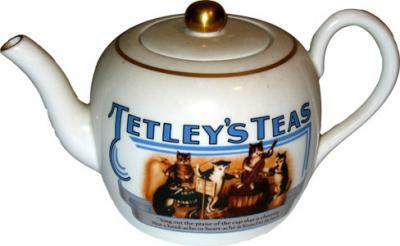 Eventually the brothers began "Joseph Tetley & Co." in 1837. Seeking to expand their business, the brothers relocated to London in 1856. London, at the time, was the center of the world's tea trade. The brothers began to focus on tea supplies. The brothers parted company and Joseph Tetley renamed the company, "Joseph Tetley and Co., Wholesale Tea Dealers." In 1871, Joseph Tetley took his son, Joseph Tetley Junior into the business. Tetley Tea expanded into the blending and packing of tea. By 1888, Tetley Tea expanded into the United States, and began to distribute tea in the country. Joseph Tetley Junior took over the business in 1889, after the death of his father. Tetley Tea continued to expand in America, and by 1913 Tetley Tea had established plants in New York City. Tea bags were accidentally invented in 1908 when Thomas Sullivan began to send sample tea in silk bags, rather than the more expensive tins. Recipients of these silk bags thought the tea was intended to be brewed in such a way, and placed the bags into their cups. As this practice grew more well-known, Tetley Tea also began to expand into tea bags. While tea bags only made up about 5% of Tetley Tea sales by the 1930s, Tetley Tea persisted as they believed tea bags would be the future of tea. In 1953, Tetley Tea launched the Tetley Tea Bag in Britain. The Tetley Tea Bag has now become one of Tetley's largest sources of income, and Tetley Tea has continued to design new tea bags. Aside from the drawstring tea bag, where the tea bag has two strings for easy wringing, Tetley has also recently designed the round tea bag for easier and more consistent brewing.